Some 1000 participants joined the so-called Lukov March, a procession deemed to be neo-Nazi, whose organizers defend it as patriotic. 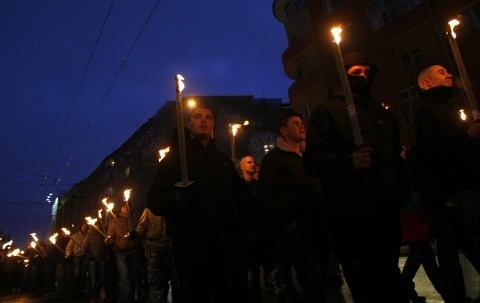 The 2012 "Lukov March" procession, which has been held for the last couple of years by Bulgarian far-right formations to honor the memory of Gen. Hristo Lukov, a hero from Bulgaria's national unification wars turned an anti-Semite and a pro-Nazi activist, was also said to honor the memory of Vasil Levski, Bulgaria's undisputed national hero from the anti-Ottoman liberation struggle. The so called Lukov March has been initiated by the Bulgarian National Union, a far-right organization, but appears to have attracted some members of the general audience as well. After standing out during the Balkan Wars of 1912-1913, General Hristo Lukov (1888-1943) was the commanding General of the 13th Division of the Bulgaria's Army during World War I, and later a Minister of War. In the late 1930s and during the Second World War he was a great supporter of the Axis powers, particularly Nazi Germany; he is known to have voiced demands that Bulgaria's legislation be made more antisemitic and closer to that of Hitler's Nazi Germany. Lukov was the the leader of the right extremist Union of Bulgarian National Legions, which many Bulgarian historians deem the only real fascist organization in Bulgaria during World War II. Lukov was murdered by communist insurgents in 1943. Lukov March was met with protests and criticism by a number of organizations – ranging from the European Network against Racism (ENAR), to the Bulgarian NGO HoRa ("People against Racism), to the youth organization of the Bulgarian Socialist Party. HoRa have accused the participants in the Lukov March of staging beatings of Roma, LGBQT people, foreigners, and leftist activists, and have described the march as shameful for Sofia, a European capita.